Learning bar chords for the beginning acoustic guitar player can be more challenging than other more commonly used chords, but bar chords can make learning the acoustic guitar a much more exciting endeavor. Bar chords are challenging in that they may require a little more hand strength at first. It can be more difficult for the beginner guitar player to achieve a pure sound. With a little persistence, bar chords can open up an entirely different respect for the seemingly endless possibilities in guitar playing techniques. The bar chord is unique in that the index finger is used to provide a temporary “nut” to bring different chords further up on the neck of the guitar. We will focus in this lesson on a few introductory bar chords as they are built off of chords you may have learned previously when studying the A and E chords and their minors. If you need to, you can review acoustic guitar chords in previous lessons. Using fingers 2-3-4, first chord a standard E chord on the first and second fret. Then, slide the fingers up 3 frets toward the body. Next, place the index finger across all 6 strings of the 3rd fret. Finger #2 should be on the 3rd string, 4th fret, while fingers 3 and 4 should be on the 5th and 4th strings of the 5th fret consecutively. The E form does not change as pertaining to fingers 2-3 and 4. (See G chord barred). Using this same form, slide it up and down the neck of the guitar while strumming. The sound may be sketchy at first, but continue to practice and build hand strength so you can press these bar chords firmly and cleanly. Using the directions for the E form bar chord in the previous paragraph, do everything identically except lift finger # 2 this time. 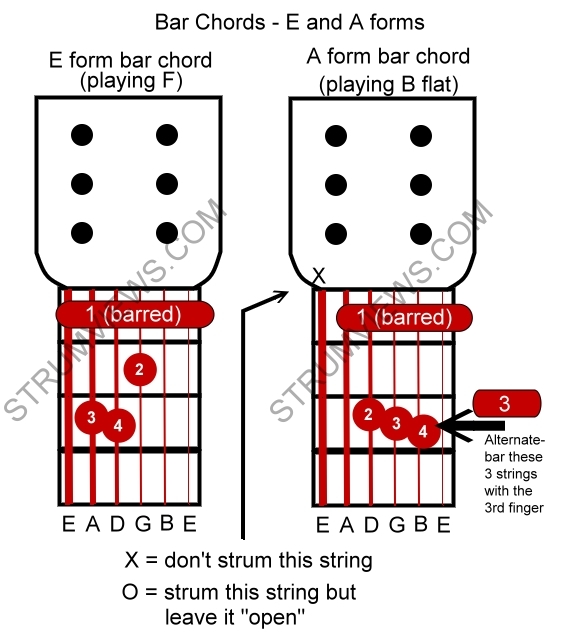 This is the Em form as it should only have fingers 3 and 4 on the 5th and 4th strings consecutively. 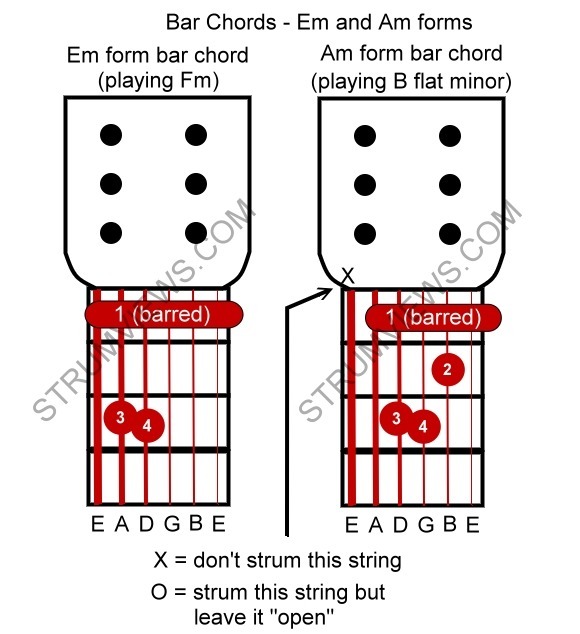 The A form bar chord is a little more tricky, and there are perhaps a few ways to perform it. Using the same fingers, 2-3-4, chord the normal A chord. Then, slide all fingers up 1 fret (closer to the body). Lay the index finger across all 6 strings on the first fret. This is the A form bar chord playing a B flat. Another way to create the A form chord is to use only two fingers, the index (#1) and the ring finger (#3). In this technique, bar all 6 strings in the same fret with the index finger. Next, skip 1 fret and bar only strings 2-3-4 by bending the ring finger to chord all 3 of these strings at once. Using the same directions as in the previous paragraph for the A form bar chord, create the normal Am chord using the fingers 2-3-4. Notice that if you refer to previous lessons on chords, you will see we are using alternate forms of chords E, Em, A and Am. Now, slide the fingers up 1 fret (closer to the body of the acoustic guitar) and bar all 6 strings (or just strings 1-5) with the index finger again. Practice sliding all of these forms of bar chords up and down the fret board while switching between forms for E, Em, A and Am. Continue to practice daily or as often as possible until you are able to build appropriate hand strength and comfort. Mastering bar chords can be a real pain, but the results will be rewarding as you will quickly become a more advanced beginner guitar player. Aaron Schulman publishes professional websites and has been playing guitar for over 20 years. He has written acoustic guitar reviews at his site, strumviews.com to help people learn how to find the best beginner acoustic guitar for their investment.